How can you go wrong with this. I just bought one to have at practice. Sorry, guess I should have posted this in the ebay BIN deals section up above. oops, could have saved a buck through Music123. Pretty sure I owned the same set in natural finish under the stencil name Groove Percussion (Sam Ash brand). They sounded surprisingly good. A student of mine has them now. Pretty amazing. Good for a beater kit or for a kid. Of course, you still have to figure in the costs of a few new heads but hard to get better than this for a new small kit. I have that drum kit. It seems well made. Small, transportable. Sounds OK. Looks nice. I've not liked the cheap quality/feel of these import kits and the cheap metal parts they use. Hoops are flimsy, lugs are super thin as are leg brackets, and hard to tune. I had a birch kit (Custom Classics) that, if it had heavier hoops, didn't have FT leg mounts that broke (2 of 3! ), would have been a decent kit. I was tempted to upgrade hoops and get tube lugs, but that would be way more than the cost of the kit. For $150 in parts + $150 drums, I'd rather find a used Catalina kit. But if this works for you, then great. As an aside, I have a Sonor Safari kit I picked up from GC used for $200 - great quality and finish over other import kits I've seen/played. I think we put so much emphasis on drum shells, it's easy to forget how much decent hardware costs. Drum heads too, since these kits tend to come with garbage heads. I love a bargain, but sometimes a bargain just ain't so. I think the hardware on the drums is OK. Hoops are about 2.5 mm. Tom has a suspension mount. The heads are OK, Remo coated UT heads. I plan to replace the heads with pinstripes and an EMAD 2 on the bass eventually. JazzDrumGuy, I can't disagree with anything you've said here. They are what they are. Thing is, it'll be used only for practice, so it will never be gigged. And we play only jazz and old standards, so it's not like I'll be playing head bangin music on these. Plus, I've got tons of good used and some new heads to put on, so I should be able to get a respectable sound out of them. Bottom line, for a paltry $150, as a practice kit, these will serve me well for many years. Yrs ago when my band hosted a blues jam,for 9 yrs straight, i bought a SP kit 12,15,20 for $150,out the doors of GC,I got great reviews from the other drummers. The mounting hardware was cheap,chroming funky and they didnt project as well as others but hey...$150! OMG, Musicians Friend has dropped the price to $139.99 and Music123, in a race to the bottom lowered theirs to $138.99. I don't know what they had to pay for these, but there can't be much profit at those prices. Spend a little more and get a Sawtooth kit. Interesting thought John, makes me wonder which one is really better? Anyone going to take two for the team and buy one of each for reviewing purposes? MF and 123 are the same company! Don't know the Sawtooth sets, but the place I teach had some SPL sets last year and they were pretty ok for the money. I put a few together. This year they got some entry level Pearl and they are almost identical to the SPL sets. Bob, I also don't understand how they can be sold for so cheap and they still make a profit! I totally get they are a great deal. My only concern is that I had this "great deal" practice kit, too, and it collapsed on me and I'm not a hard player, either........making it a not so great deal considering repair costs (I ended up selling it for cheaper)! But I hope it works out for all of you folks! I had these in my cart yesterday for $125, but decided not to buy. They would have been a gift for my nephew, but he is only 3 years old. I would have had to hold on to them for a few years before he could actually fit behind the kit. I figure the deal will come back around another time in the next few years. Nah... he'll fit. 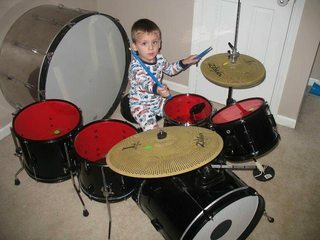 My boy is 4 here, but he got this kit when he was 3.
guys keep this up it'll put Rogers, slingerland, Leedy out of business..